Here are the best Rite Aid deals this week, with thanks to Shannon for her help in compiling them. If you are new to shopping at Rite Aid or have questions about their coupon policy, click here. See the full list of deals at Rite Aid this week here. Do you have your shopping trip planned or did you come up with a great deal scenario/idea? Just post about it on your blog and leave your link below. To make it easy for everyone to navigate quickly through the links, your link must link directly to your Rite Aid deals post. Links going to the homepage of your blog or any other part of your blog besides the direct link to your Rite Aid deals post will be deleted. Looking for more? 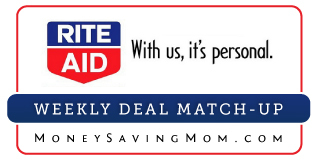 Read more posts about Rite Aid Deals.